A Solar Pool Cover is one of the most economical covers you can get for your swimming pool. They are also referred to as solar blankets. 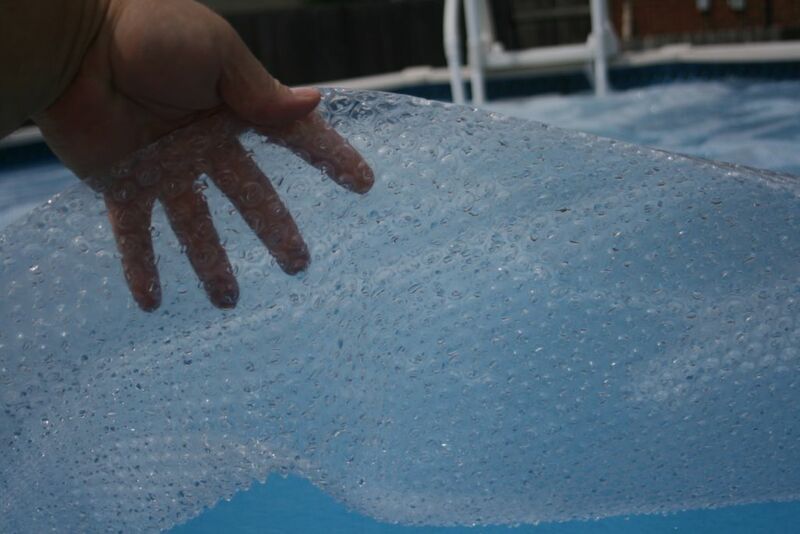 Solar Pool Covers or Blankets are similar to large sheets of bubble wrap. The bubbles in Solar covers trap the heat from the sun and disperses the heat to your pool, which keeps the temperature of the water in your pool warm and soothing. The solar cover also helps to preserve the warmth of the water from the sun and continues to keep it warm from the cool night time temperatures. With Solar covers, it is not necessary to use anchor weights or tie down straps to hold them in place; since they lay and float on top of your pool's water without restraints. Therefore, removal and replacement of a solar cover is very easy, just pull it off and store it. However this can be a awkward and strenuous task - imagine folding a giant wet blanket by yourself - but by incorporating the help or aid of a solar pool cover reel, this task can be made much easier. Solar covers are usually folded and stored or rolled-up on a large solar pool cover reel and wheeled out of the way and put up for storage. Solar Blankets can help in any climate or all parts of the country, but they are ideal for use in sunny climates because the more heat they can trap, the warmer your pool water will stay; and this can allow you to use your swimming pool more and keep it open longer than your normal swim season. Solar pool covers can raise water temperature by as much as 10-15 degrees. It is important to remember that, although any cover will reduce some of the debris that enters a pool, solar pool covers are not designed specifically for cleanliness, nor are they considered safety covers. Solar pool covers must be completely removed from the pool before swimmers enter the water, to reduce the chance of an accident. Solar Pool Covers work equally as well on both Above Ground and In Ground Swimming Pools.